Fresh thyme leaves and zesty lemon rind and juice keep these cutlets moist as they cook. The warm bean salad is a great side with the lamb. Brush each cutlet lightly with oil. Season with salt and pepper and sprinkle each with lemon rind and thyme. Preheat the barbecue, pan or char-grill pan to hot before adding the cutlets. Cook cutlets on one side until the first sign of moisture appears on the top. Turn, brush with the lemon juice and cook further until done to your preference. Turn once only. Remove cutlets from heat, loosely cover with foil and rest cutlets for 2 minutes before serving. Cook green beans until tender and refresh under cold water. Toss together with the tomato and dressing. Test lamb cutlets for doneness with the back of your tongs. Rare is soft when pressed, medium is ‘springy’ and well done is very firm. Rest the meat for a few minutes before serving. Always rest meat after cooking. This gives the juices in the meat a chance to redistribute, giving a moister and more tender result. Transfer the roast to a plate and loosely cover with foil, stand the meat to rest in a warm place. Pre set the oven to grill mode. Using a sharp paring knife, make 10 small incisions into the lamb and insert a rosemary sprig and a garlic clove into each cut. Combine in a blender the olive oil, lemon zest and juice, 3 garlic cloves, lemon thyme and seasoning. Rub this well into the lamb and place onto a roasting tray. Place into the oven and allow to brown using the grill mode, watching carefully so that it does not burn. Turn over and brown the bottom side. Switch the oven to convection mode and set to 180°C. Turn the leg so that the skin and meat face the top and roast for 45 minutes, basting several times. After 45 minutes, add the halved capsicums and onions to the lamb tray and roast for 30 minutes. Remove from the oven and allow to rest (covered) for 20 minutes. Remove the skins from the capsicums and discard. Carve the Lamb and present with the onions and roasted capsicums. Set the oven to 160°C. Season all sides of the veal sections well, pan grill in extra virgin olive oil until golden on all sides and set aside. Melt the butter in a heavy based frypan and add a little olive oil. Add the carrots, celery and onions and cook until soft but do not brown. Add in the tomato paste and cook for 1 minute. Add in the white wine and stir well to dissolve all the sediments. Stir in the stock, tomatoes, mandarin zest and bay leaves. Place the grilled veal shanks into an ovenproof dish and ladle over the vegetables and sauce. Cover with aluminium foil and place into the pre-heated oven for 90 minutes or until just tender. A quick and nutritious pack lunch staple, wraps are a delicious sandwich option. Add lamb, lettuce, tomatoes, onion, basil and extra rosemary to each, and then roll up the flat bread. Preheat barbecue to hot. Brush lamb with oil, add rosemary and season with salt and pepper. Slice lamb. Spread bread with mayonnaise. Add Lamb, lettuce, tomatoes, onion, basil and extra rosemary to each, and then roll up the bread. You can replace the Lamb round or topside steaks with Lamb eye of shortloin/backstrap or fillet/tenderloin. You can use a brush to lightly oil the meat or a light spray of oil. Always rest meat after cooking. This gives the meat juices a chance to redistribute, giving a moister and more tender result. Transfer the Lamb from the barbecue to a plate and loosely cover with foil. Allow the Lamb to rest in a warm place. Its true, casseroles and curries taste even better the next day; their flavour mellows beautifully. 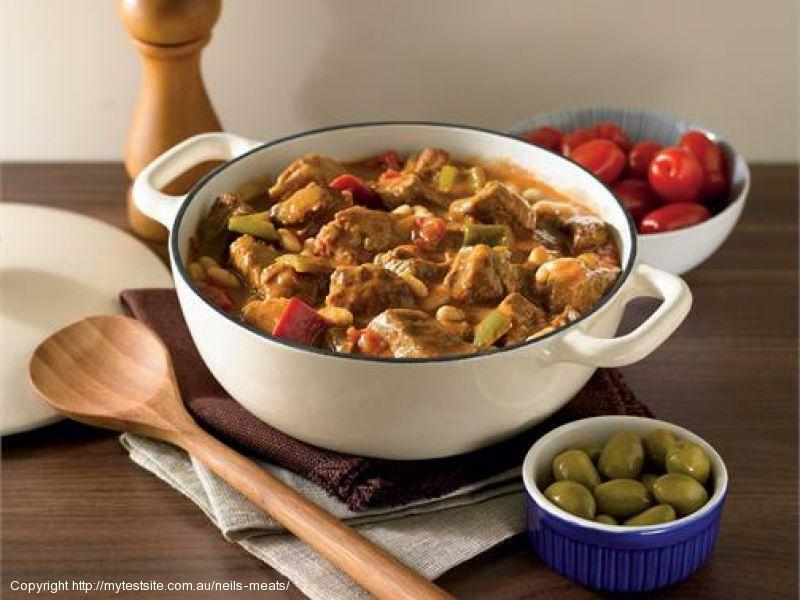 This lamb curry is certainly one to do ahead, add the spinach when you reheat it. A casserole will keep for up to 2 to 3 days in the refrigerator. Casseroles should be refrigerated immediately after the steam from cooking has evaporated. Place the hot casserole into a shallow container in the fridge so it cools quickly. Do not leave it to cool completely on the bench. To serve bring it slowly to the boil over a medium heat, reduce heat and simmer for about 3 minutes, or until the meat and sauce are both thoroughly hot. Season the lamb with salt and pepper, add a little oil, and mix well. Heat a large heavy-based pan over a medium-high heat. Brown the lamb in 2 or 3 batches. Remove each batch and set aside. Add the curry paste to the pan and heat until fragrant. Pour in the stock. Bring to the boil, and then reduce heat to simmering point. Return the lamb to the pan, simmer partially covered for 1 hour. Check that the dish simmers gently during the cooking time. Stir occasionally and adjust the heat if needed. Add a little water if needed. Add kumara and coconut milk, simmer partially covered for a further 30 minutes. Add spinach just before serving. Serve with steamed rice. Don’t rush the initial stage of browning the meat. This will make this dish rich in colour and flavour. Brown the meat in small batches over a medium-high heat. Simmer the casserole gently and taste it to see if it’s ready. Stir occasionally and adjust the heat as it cooks if needed. When it’s done the meat should be tender enough to fall apart easily with a fork. An uncomplicated recipe that brings lamb and other simple ingredients like carrots, tomatoes and kidney beans together beautifully. It makes for a great family meal. The best lamb cuts for or casseroling or braising include diced lamb forequarter, forequarter chops, shanks, Frenched shanks, neck chops, lamb topside, leg (bone-in), shoulder (bone-in), easy carve (leg or shoulder bone out), boned and rolled shoulder or leg. Season the lamb with salt and pepper, add a little oil, and mix well. Heat a large heavy-based pan over a moderately-high heat. Brown the lamb in 2 or 3 batches. Remove each batch and set aside. Add the carrots and celery to the pan and cook for 1 minute or until softened. Add the tomatoes and stock. Bring to the boil, and then reduce heat to simmering point. Return the lamb to the pan, simmer partially covered for 1 hour. Check that the dish simmers gently during the cooking time. Stir occasionally and adjust the heat if needed. Add a little water if needed. Add the kidney beans and cook 30 minutes more until Lamb is very tender. Serve with mashed potato. This is a great dish to make in the slow cooker. It’s simple to assemble the night before, in the morning just place it in the slow cooker, flip the switch and dinner will be ready when you get home from work. Heaven! Preheat the oven to 180°C. Cut the beef into 2.5cm-3cm cubes. Season with salt and pepper, add about 2 tablespoons of oil and mix well. Heat a large frypan over a medium-high heat. Brown the beef in 2 or 3 batches. Remove each batch and place in a casserole dish. Reduce heat in pan and add a little oil. Add the onion, garlic and capsicums, cook for 1–2 minutes and stir occasionally. Sprinkle in the flour and stir until the vegetables are coated. Gradually pour in the stock, stirring well. Add the tomato paste and oregano. Pour over the beef in the casserole dish and stir to combine. Cover the casserole dish, place in the oven and cook until the beef is very tender. In the last 30 minutes of cooking time, add the tomatoes and cannellini beans. Place the browned Beef and other ingredients in a heavy-based pot. Partially cover, keep the heat low. Simmer until the meat is very tender. Stir occasionally, adding water if needed during the cooking time to keep ingredients just covered. In the last 30 minutes of cooking time, add the tomatoes and cannellini beans. Brown the Beef well as per the recipe and place in the slow cooker. Place the garlic and capsicum in to the slow cooker with the Beef. Blend the flour with the Beef stock and tomato paste, add the oregano and diced tomatoes, add to the Beef. You may need to add a little Beef stock or water if it appears that the liquid does not cover the Beef. Cover the slow cooker with its lid, cook on Low Setting for 8-10 hours or the High Setting for 4-5 hours. Stir in the cannellini beans in the last 40 minutes of the cooking time. Heat a large heavy based braising pan and add the oil. Season the lamb shanks well, place into the pan and brown well on all sides, then transfer to a holding plate. Place the cumin and coriander seeds into a saucepan and heat up until fragrant. Transfer to a mortar and pestle and grind until fine. Place the onions into a heated pan with a little oil and cook until lightly brown. Then add the carrots, celery and whole rosemary sprigs. Continue until lightly browned, then add the red wine and stir well to dissolve all the sediments. Add the stock, diced tomato, chutney, spices, bay leaves and lamb shanks. Place a lid on the pan and transfer to a pre-heated oven set at 160°C. Cook slowly for two to three hours or until very tender. Remove from the oven, discard the rosemary and bay leaf and check for seasoning. Remove the lamb shanks to a plate and set aside. Place the strained sauce into a saucepan, bring to a boil and reduce until slightly thick. Combine the shanks and reduced sauce, cover and keep warm until required. Peel and core the parsnips, cut into dice and place into a saucepan with the butter. Cook gently for 5 minutes then add in the cream and milk. Cook until tender, drain, place into a blender and puree with a little of the strained liquid. Season well and set aside. The best beef steak cuts for slicing into strips for stir-frying include rump, rib eye/scotch fillet, sirloin/porterhouse/New York and oyster blade steaks. Add oil to the beef rather than adding oil to the wok – you’ll use less oil, and the meat will brown well. You can also add ingredients like a little soy or grated ginger for flavour. Use your fingers to massage the oil into the meat strips. Cut beef across grain into thin strips. Add a little oil to beef, mix well. Heat the wok, ensure it is hot. Stir-fry beef in 2 batches, reheat wok between each batch. Reheat the wok, add the oil and heat. Add carrot, capsicum, choy sum and ginger. Stir-fry for 1-2 mins. Add cabbage, stir-fry for 30 seconds. Add noodles, stir-fry until noodles are hot. Return Beef to the wok, toss to warm through, add lime juice and spring onions. Sprinkle with sesame seeds to serve. Set the oven to 150°C. Season the beef cheeks and place into a preheated pan with two tablespoons of olive oil and brown well on all sides. Remove and set aside. Heat a heavy braising pan, adding the remaining two tablespoons of olive oil, garlic and chorizo. Stir well and cook for several minutes, then add in the diced shallots. Brown slightly, and then add in the thyme leaves, celery, carrots and mushrooms. When lightly browned, push the mix to the sides and add in the tomato paste to the cleared middle of the pan, stirring well and fry for 30 seconds. Add in the red wine and stir well to loosen all the sediments on the bottom. Combine in the tomatoes, stock and crushed juniper berries. Place the browned beef cheeks into the sauce, cover and place into the oven. Cook slowly for 4 hours or until succulent and tender. Pickled carrots; combine in a saucepan, 1 cup water, ¾ cup white wine vinegar and ¼ cup castor sugar. Bring to a boil and pour over the thinly sliced carrots. Allow to cool then store in the fridge. Pre heat the oven to 150°C. Cut the rump into large 40mm pieces and place into a bowl. Add the red wine, sliced onion; fresh thyme, seasoning and olive oil then combine well. Cover and refrigerate overnight. The next day remove the meat, drain and pat dry with kitchen paper. Retain the wine for cooking later but discard the onions and thyme. Heat a large heavy base pot and add the extra virgin olive oil. Bring up to heat and add the speck, frying until crisp, then remove to a bowl. Add the small peeled eschallots and cook until golden, then place with the bacon. Add in the mushrooms and cook until sizzling and golden. Remove and add to the speck and eschallots. Add more olive oil and when very hot add the beef pieces and cook until well browned. Add the garlic and cook for several more minutes. Remove and set aside. Heat the pan with a little olive oil and add in the carrots, celery, onions and leeks. Allow to brown then add in the tomato paste and cook for several minutes. Add in the strained red wine and stir well to dissolve all the sediments. Bring to a simmer, add in the stock and bay leaf, cover with a lid and braise slowly for 1 to 2 hours on until the meat is tender. Top with extra wine or stock if required during the cooking process. Remove all the meat and set aside. Strain the liquid and discard the vegetables. Boil the liquid and reduce until slightly thick. Combine together the tender beef with the reduced liquid, speck, mushrooms, eschallots and thyme leaves. Ask your butcher to bone and butterfly the leg of lamb for you. Barbecue this lamb cut to more than medium, so all of the meats stays juicy, and always rest meat after cooking. This gives the juices in the meat a chance to redistribute, giving a moister and more tender result. Transfer the meat to a plate and loosely cover with foil, stand the meat to rest in a warm place. Preheat the barbecue flat-plate or char-grill plate to hot. Score the inside of the butterflied lamb leg in a criss-cross fashion. Combine rosemary, oil and mustard and smear over both sides of lamb. Place the Lamb on the barbecue, reduce heat to moderately-hot. Cook the first side of the Lamb for 20 minutes, turn and cook for a further 20 minutes. To make Herb mayonnaise: Combine mayonnaise with freshly chopped herbs and squeeze of lemon juice.